Anyone who thought yesterday's post--about the five games I have to get back to (and hopefully finish) in 2013--was shameful is sure to flat-out swoon (in a bad way) as a result of today's post, which shines a forlorn light on a handful of games that I've not only failed to wrap up, but failed to unwrap. Once again, I'll focus on just five games in this post, although I sincerely doubt that's the extent of my still-shrink-wrapped backlog. 1. Chulip (PS2)--Of all the games I own but have yet to play, this obscure PS2 release is the one that pains me the most. After all, it's completely "my cup of tea," as they say--it's Japanese, it's quirky (which often goes hand in hand with being Japanese, I know), it's cute ... oh, and it involves kissing people in public. 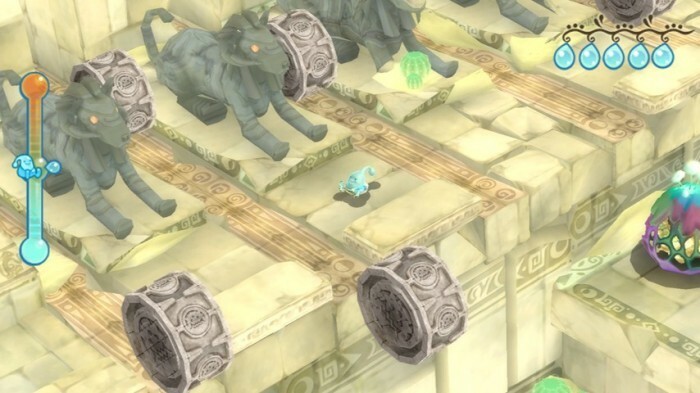 Why have I not played this again? 2. Dewy's Adventure (Wii)--Full disclosure: I've actually opened this one. Not only that, but I've played a tiny bit of it. Just a tiny bit, though--probably just 15 minutes or so. Even then, it was quite a few years ago, so I hardly remember what it was like. I do recall being at least mildly (if not mostly) turned off by its motion-controlled gameplay, though, so I'm feeling apprehensive about picking it up again. Don't worry, I'll "take one for the team" sometime next year just so I can finally review the damn thing. 3. Dragon Quest Heroes: Rocket Slime (DS)--I only bought this Square Enix game a few months ago, so I don't feel as bad about this unopened game as I do the others included here. Still, you'd think I would've at least freed it from its plastic wrap and checked out its manual--especially given my love for the Dragon Quest series' slime character. Would you believe me if I promised to boot it up in the next few months? 4. Hot Shots Golf (PSP)--This is a fairly recent acquisition, too, if memory serves. Given my overwhelmingly positive experience with its sister title, Hot Shots Tennis, though, I'm shocked it's remained imprisoned in its original packaging for so long. Does this mean my love affair with my PSP is almost over? Say it ain't so! Maybe the spark would be rekindled if I picked up a pink or purple (lilac, really) PSP in 2013. 5. 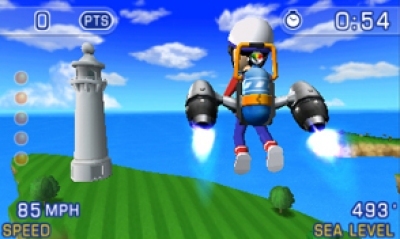 Pilotwings Resort (3DS)--Note: I could have included another 3DS game, Steel Diver, on this list, too, but since I decided to focus on just five unfortunately overlooked titles I had to make the tough decision to focus on just one of them. That said, I'm not sure why I went with Pilotwings Resort. Maybe it was because I was far more interested in it than in Steel Diver when I bought both games from Best Buy for $10 total late last year? Regardless, I'm sure I'll get around to playing them eventually, although I'd be lying if I said I'm currently excited about the prospect. Now that I've had my say, I have to ask: Are any of you in the same boat? Are there unwrapped or simply unplayed games in your collections that you'd like to spend some quality time with in the coming 12 months? I recently bought Rocket Slime for the third time because I figure the game will...ripen with each time I attempt to play it. It's almost cloyingly cute and charming, but I don't find it much fun. I also got rid of my PS2 a few months ago, so seeing Chulip up on PSN made me happy, as it was one of the last games I bought for the system, and, like you, I never actually got around to playing it. Ha! I'm kind of surprised to hear you say you've bought Rocket Slime three times, lunch -- esp. since it seems you didn't much like it the first two times. There must be something you like about it, though, otherwise you surely would've given up on it by now? As for owning Chulip but not playing it: I wonder if that's a pretty common phenomenon? Regardless, I think both of us should force ourselves to play it soon, don't you? Now that's interesting, Anthony! I wonder how many people (North Americans, especially) can say the same? Anyway, the question is: Did you find that you love the mainline Dragon Quest games, too, or do you prefer Rocket Slime? I've never played a main-series DQ game, but boy did I love Rocket Slime. It's really adorable and satisfying. I hope to god the next one comes out in the West. Well, DraQue is a more classic RPG adventure. I loved DraQue IV, the fifth one was too misogynistic and old-fashioned in its story... The VII is boring, the IX is even more boring... I've yet to play DraQue IV tho. But, idk, I think Rocket Slime is a very simple yet addictive game. I don't typically play DragonQuest or RPGs in general, but I had to give Rocket Slime a go, it was just too weird to miss. I do have a lot of games I haven't really given proper attention to, but the one sitting in its shrink wrap is ExciteBots for Wii. I bought it and meant to play it and then something "more important" came out and I never got back to it. I'm surprised you never made the leap to trying a mainline DQ game, tone def. Why is that, if you don't mind me asking? Are you just not an RPG fan? If you enjoy RPGs at all, BTW, I'd highly recommend at least trying DQ IX, as it's easily one of my favorite DS games. You thought IX was boring? Awwww! I really liked it. In fact, I believe I played it more than just about any other DS game--which is quite an accomplishment, let me tell you! Anyway, sounds like I'll have to give IV a try at some point. Maybe the DS remake? I don't know if I'll play it first, Kimimi, but I'll definitely play it. 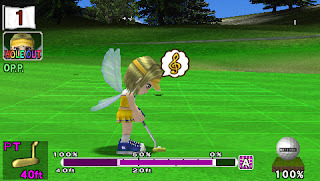 I absolutely love Mario Golf, and I believe this plays similarly. Plus, like I said in the post, I loooooooved Hot Shots Tennis, made by the same folks, so I'm sure I'll like this one, too. Just have to force myself to play it, I guess! So, did you actually enjoy Rocket Slime when you got around to playing it, Michael? Also, I'm not surprised to hear someone say mention ExciteBots as being one of those still-shrink-wrapped games as, like Rocket Slime, it's one of those games that was known for being really weird/fun, which likely prompted a lot of people to pick it up on a whim. Anyway, I hope you get around to it someday, as I'd love to hear what you think of it! This used to be a problem for me, but now I have a rule that when I buy ANY game I have to at least play to the first save point. I also don't buy games for systems that I don't own with the idea that I will own them some day. Having said that, you should be ashamed for not playing Rocket Slime! It is the only Dragon Quest game I've ever really liked (I know that's heresy around here, but I like to have at least a little strategy in my RPGs thank you). Not only did I finish it, but I did all the extra things too. It's absolutely one of the best games on the DS. Off of the top of my head, I own, but have yet to play A Boy and His Blob (Wii), Skyward Sword, Professor Layton 2&3, Metroid: Other M, Kirby's Return to Dreamland, Fire Emblem: Radiant Dawn, and probably more. I'm a terrible person. Sounds like a good rule to live by, Steve! Wish I could live by it myself :P I do think I have to stop buying games for systems I don't yet own, though. I just can't help myself sometimes! As for Rocket Slime: Don't be too mad at me. Like I said, I only picked it up a month or two ago--which for me isn't long when it comes to games I've bought but haven't played. I've heard such amazing things about it, though, that I'll definitely try it soon--and of course let everyone know what I think of it. Chulip is a lot more fun to own than it is to play. I mean I love the environments, the quirky characters and the humor. I even still use the free keychain that came with it. But it's really hard to figure out what to do in the game w/o constantly using faqs. And the load times are atrocious. Actually I have a hard time enjoying adventure games these days, so maybe I'm not the best person to ask. But even I think you at least need to play it a little just to see what it's like. You're not a terrible person, 2D2Will. Or, if you are, so am I--and so are a good percentage of the folks who read this blog, I'm sure! Anyway, I've long had my eye on the Wii remake of A Boy and His Blob, so good for you for picking it up. Actually, I've long wanted a number of the games on your list. Of course, had I picked them up, a good number of them likely would still be unplayed, so I guess it's good that I've held off! I have a legitimate excuse not owning a PS2 and not having access to a PS3, but I'm going to guess you don't have the same. I look forward to tomorrow's post about you starting Chulip. I ran into the FAQ problem too, and incredibly early in in the game as well. I don't remember the load times being too bad, although I was playing it through an emulator. Like Rocket Slime, it's immediately endearing but a bit of a chore to actually play. I love the game's setting though. I'm a sucker for realistic video game towns. Oh, yes, I'll give it a try regardless, Steve. Also, I've heard these complaints before, so I'm not going into the game completely blind at least. Thank you for that! Ah, that makes sense -- if you don't like Zelda, and Rocket Slime is a lot like Zelda, why would you like it? Well, except for the presence of the adorable DQ slime, I mean. Which is why I'm attracted to the game, too, by the way. Rocket Slime is nothing like Zelda. It's a somewhat "arcade-y" action game between two battleships where you launch stuff at your opponent, and try to take over their ship. well now that I think about there is some exploration as well, but nothing anywhere near as heavy as a Zelda dungeon. Oh, I liked Rocket Slime quite a bit! I have to admit there came a point where the tank battles started to feel kind of monotonous, which is too bad because that weird mechanic is what really drew me to the game in the first place, but it was generally fun and enjoyable throughout. Ah, well, I certainly can't jump in here, as I've yet to play it! That said, I have seen screenshots of the battleship portions of the game. Regardless, I'm interested! 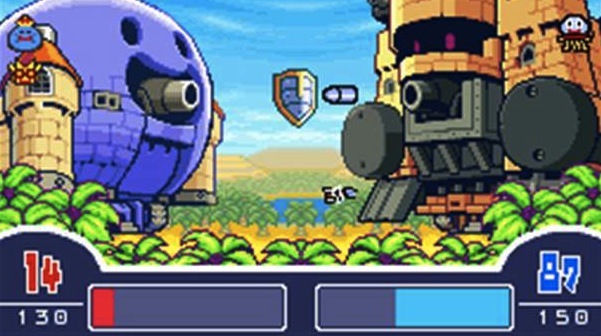 I wonder, though, Steve: Does the GBA original also have the battleship portions? I don't think they do. Maybe that's the game lunch was talking about? I really like the looks of the tank battles, Michael, but I've yet to see them in action or even read a description of how they play out, etc. Regardless, I'm glad to hear you had fun with the game and found it enjoyable! You haven't played Rocket Slime?! Oh man. I loved that game! As far as what I want to play this next year...eh...I'm working my way through a back catalogue of PS3 games. Right now I'm playing Uncharted 2, which I'm enjoying about 75% of. The gunplay is okay, but the platforming, characters, and plot are great! So...yeah. I've got Bioshock 2 on that list. And...depending on what I get for Christmas, who knows?! Good point! The GBA game's in Japanese, so I haven't played it much, but I went and checked the FAQ for it, and you may be right. The GBA walkthrough sounds a lot more Zelda-y than the DS game I remember. Of course this was 6 years ago, so maybe I'm forgetting what the the DS game was really like. Yeah, I know I've read a bit about the GBA original, and I thought battles in that version were played out in real time and on the field, a la Zelda, rather than in tanks as in the DS version.